On August 21 2018 in Ha Noi, the Vingroup conglomerate signed the agreement of cooperation with HCMUTE and 50 other leading universities in Vietnam. This is a series of political activities to hone the basic knowledge of Marxism-Leninism, Ho Chi Minh's ideology and is also a practical activity to create a movement to study political disciplines among students and young union and party members. After months of various activities, the final of Miss Vietnam 2018 took place with the presence of 43 outstanding beauties from many different areas all over Vietnam, and the coveted crown was eventually awarded to 18-year-old Tran Tieu Vy—a Business Administration freshman in the joint program between the University of Sunderland and HCMUTE. On October 20, 2018, at the Great Hall of the A Building, HCMUTE celebrated the 20th anniversary of the founding of Vietnam Student Association - HCMUTE "20 years – the white dove journey". On October 20 2018, at the Great Hall of the HCMUTE, the "Training session on road traffic and driving safety skills for students in 2018" with the participation of more than 500 students in the whole school. This was a very useful program by the Ministry of Education and Training, the National Traffic Safety Committee, Honda dealerships all over the country. 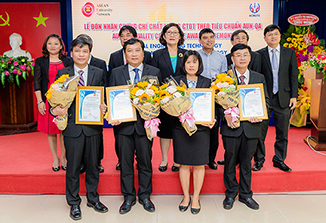 On October 13 2018, based on the idea of ​​"Automation Project-Based Learning Competition", the Representative Office of Arizona State University in Vietnam in cooperation with the BUILD-IT project and the Rockwell Automation Company, Polyco Corporation, and the United States Agency for International Development (USAID) organized the "Rockwell Automation Competition" at the HCMUTE. After an escapade that lasted over a month, from more than 200 contestants went thtough the qualification round, semifinal 1, semifinal 2, The Student Mic Competition 2018 came to an end on the night of May 10, 2018 at HCMUTE. On October 5, the HCMUTE held the opening ceremony of the new school year 2018 -2019 in the Building A Great Hall. Also the occasion was also the 56th anniversary of the establishment of the school (5/10/1962 - 5/10/2018). 40 years is definitely not a short period of time compared to a human’s life, and with it, ensues the inevitable law of change of things. This harsh reality was present in the gray hairand fine lines on the face or in the slow pace of the alumni on their return to their alma mater after decades. However, the enthusiasm and spirit of a youth once never seemed leave their soul. This spirit is reflected in the singing, the smile or the handshakes on the 40th anniversary of the graduation of the students in 1973 and 40 years since the matriculation of students in the 1978 batch.